Are you entering Grades 6, 7, or 8 next year? Are you a highly motivated Jewish student with very strong grades and even stronger character? Do you love to learn? Do you want to make a real contribution to your school community by using your intellect and your enthusiasm? If so, then you might be eligible to become a Jacobson Sinai Academy Middle School Merit Scholar. Thanks to generous donations from parents of current and alumni students, a limited number of students will be selected to receive 100% free, full tuition merit scholarships, beginning in the fall of 2014. These awards will be made on the basis of academic achievement and dedication to community participation and leadership. Scholarships will be awarded to deserving students entering 6th, 7th or 8th grade who have been accepted to JSA, and will be automatically renewable annually to merit scholars who maintain their high academic and community standards. For more information or to receive an application packet, contact us at meritscholarship@jsamiami.org. No phone calls, please. 5/16 Third Fridays at Temple Sinai of North Dade! Join other 20's and 30's (please kindly respect the requested age range), a great mix of couples AND singles, for a free, chill, kosher Shabbat dinner generously hosted this month by Temple Sinai of North Dade. Better yet, help us thank and wish a fond farewell to a great friend of Third Fridays, Ariella Siegel, who will be studying in Israel for a year! 7:00 pm Kabbalat Shabbat 7:30 pm Meet and Greet 8:00 pm Candles, Wine, Challah, Welcome, Eat! Come early! Come late! Come when you can, really! Even 9pm is fine! Come hungry – the menu includes chicken, salmon, rice, asparagus, salad, and more! Free! Chill! Fun! You don’t have to bring anything but if you feel compelled, please bring kosher wine and/or beer (you’ll find it’s a great way to meet people ☺). We're anticipating 100-130 young professionals so just come! The RSVP is totally optional... we take the RSVP #, double it, add a few, and cook for that many so even if you decide the night of the event to pack the car (or come solo), it's all good! Spread the word about this monthly gathering of 20's and 30's happening in a different location here in South Florida on the Third Friday of the month (hence the name!)!!! Temple Sinai of North Dade Hosts Third Fridays! FREE, chill, fun! 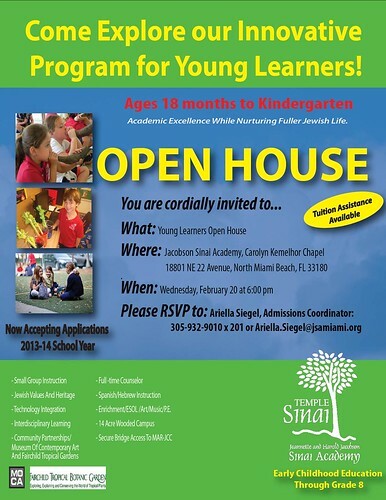 Join other 20's/30's/early 40's, a great mix of couples/singles/lgbt/whatev, for a great Shabbat dinner generously hosted this month by Temple Sinai of North Miami Beach! We've been averaging over 120 peeps when we have had it here in the past and we are confident we can have a RECORD TURNOUT if, well, you join us! 8:00pm Candles, Kiddush (wine), Announcements, Challah, Eat! Third Fridays has been happening for over three years here in south Florida thanks to our generous hosts and underwriters. It has been hosted by Reform, Conservative, and Orthodox synagogues as well as numerous family homes. The food is always certified Kosher and the atmosphere is always chill. It's always free, there's no hidden agenda, and we get really great crowd of people, some of whom "do" Shabbat every week and some of whom haven't "done" Shabbat in, like, ever. All are welcomed here!!! Q's? Contact Roland Roth, TFSF Creator/Chef, at 561-234-9385. 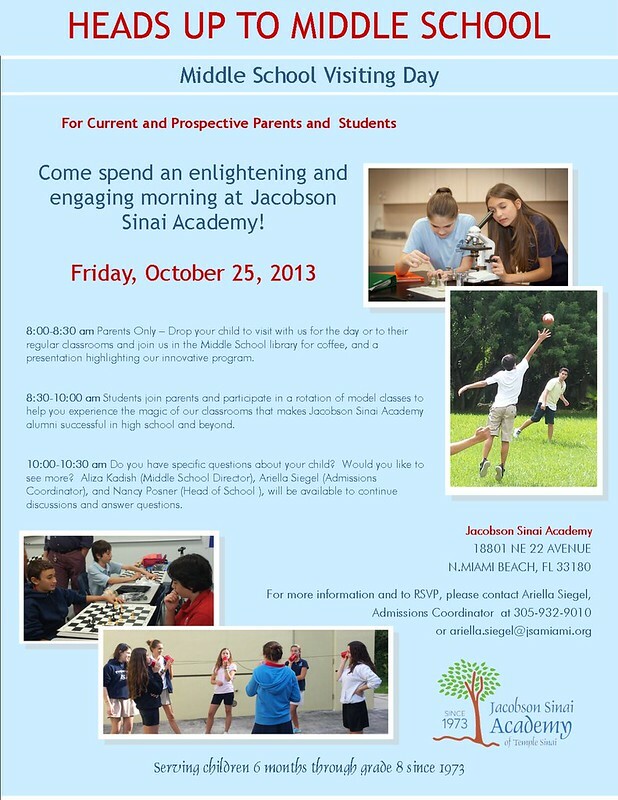 Come spend an enlightening and engaging morning at Jacobson Sinai Academy! 8:00-8:30 am Parents Only – Drop your child to visit with us for the day and join us in the Middle School library for coffee, and a presentation highlighting our innovative program. 8:30-10:00 am Students join parents and participate in a rotation of model classes to help you experience the magic of our classrooms that makes Jacobson Sinai Academy alumni successful in high school and beyond. 10:00-10:30 am Do you have specific questions about your child? Would you like to see more? Aliza Kadish (Middle School Director), Ariella Siegel (Admissions Coordinator), and Nancy Posner (Head of School ), will be available to continue discussions and answer questions. 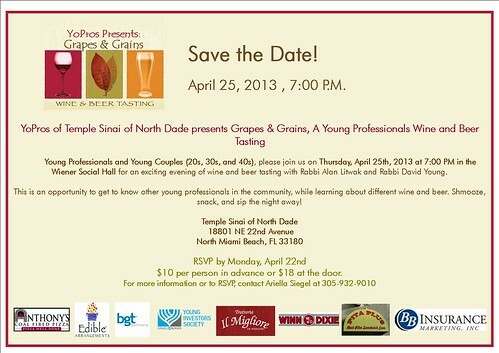 Young Professionals and Young Couples (20s, 30s, and 40s), please join us on Thursday, April 25th, 2013 at 7:00 PM in the Wiener Social Hall for an exciting evening of wine and beer tasting with Rabbi Alan Litwak and Rabbi David Young. This is an opportunity to get to know other young professionals in the community, while learning about different wine and beer. Shmooze, snack, and sip the night away! RSVP by Monday, April 22nd $10 per person in advance or $18 at the door. Sinai Night 2013 a Smashing Success! Jacobson Sinai Academy and Temple Sinai held their largest fundraiser on Saturday, March 16th at the Dezer Auto Collection Museum in the James Bond Lounge. 'Sinai Night' was a fun-filled evening featuring delicious food, open bar, raffle, and silent auction excitement. Our School and Synagogue communities joined forces this year in presenting 'Top Nosh', with a head-to-head-cook-off between our "foodie" Rabbis Litwak and Young. Rabbi Litwak emerged the victor in the Sinai version of 'Top Chef', squeaking out a win by 1 point. Celebrity judges included Tania from Tania's table, Jeremy Houghton from Johnson and Wales, and Suzanne Levin-Okun from Around Town Art & Culture Magazine. Come explore our innovative program for young learners! Ages 18 months to Kindergarten! 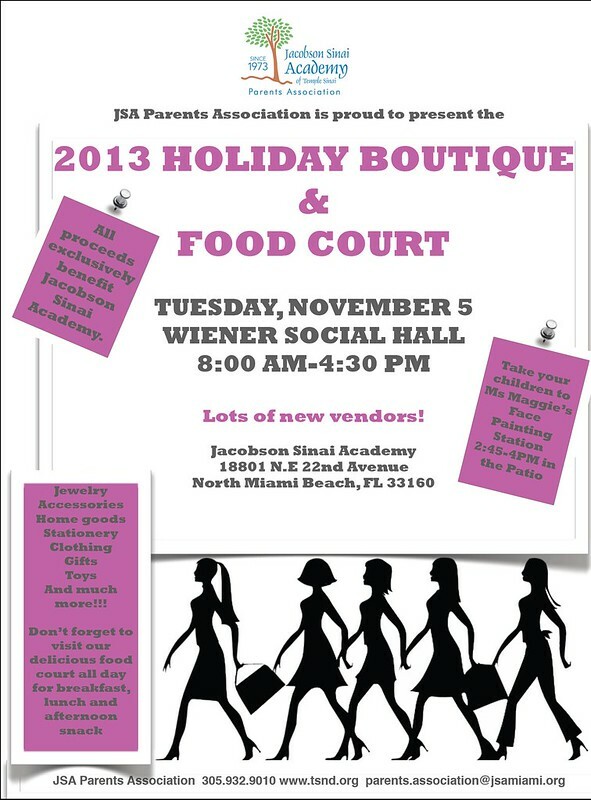 Where: Jacobson Sinai Academy, Carolyn Kemelhor Chapel 18801 NE 22 Avenue, N. Miami Beach, FL 33180.